30 States. 40 Cancer-related organizations in 1 Coalition. One voice against cancer (OVAC). Day 1 was filled with hours of training and meeting with our local state groups. Our California group was awesome. 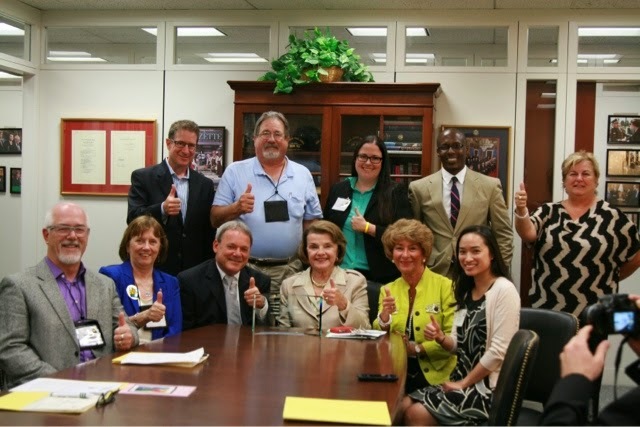 We had our first meeting with Sen. Dianne Feinstein yesterday afternoon. She took the time to hear our issues and was extremely supportive. Our ask? 2. Stop the decline of NCI funding. Raise the budget proportionately to that of the NIH. 3. $510 Million for CDC cancer prevention, early detection & screening programs. Last night, I slept 2 blocks from the Capitol of a powerful nation that I know can make cancer a priority. We also had the opportunity to present her with the OVAC Cancer Champion 2014 award. 1.6 Million Americans will be diagnosed with cancer this year, and prevention, early detection, drug development, and nursing education play a very important role. 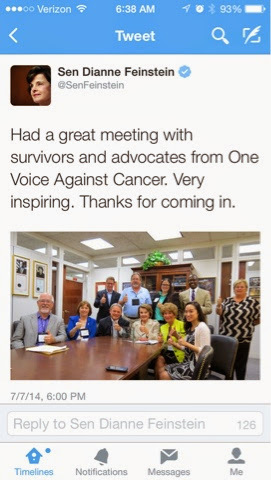 Have your #CancerVoice heard. Contact your congressmen/women & ask for the 3 things above. ONE VOICE.